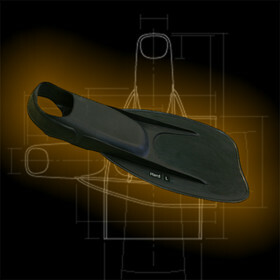 These fins, specially designed for and tested in severe UW-Rugby conditions, are highly powerful and manoeuvereable. The shape of the fins allows rapid pick-up and stops. The blade is covered with soft rubber and edged with slightly round rubber strap in order to protect other players from damages and to provide maximized game safety. Best choice for advanced UW-Rugby players and/or competition fins.